Elaine's courses are suitable for a range of audiences. Some cover many drugs and pathways, whilst others home-in on individual cancer types. Elaine delivers regular study days at the Christie in Manchester and the Marsden in London that anyone can attend. Contact Elaine to arrange a study day or webinar for your work place. Elaine can adapt existing materials or create a new course for you. The accessible guide to the principles behind new, more targeted drug treatments for cancer. Written for anyone who encounters cancer patients, cancer data or cancer terminology, but has no more than a passing knowledge of cell biology. 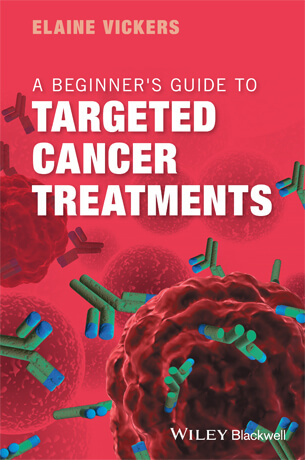 A Beginner's Guide to Targeted Cancer Treatments provides an understanding of how cancer works and the many new treatments available. Elaine provides clear, accessible and up-to-date education on cancer biology and the science of cancer treatments. She equips non-scientists – such as nurses, trials coordinators and doctors – with the knowledge to discuss new treatments with patients and colleagues. Elaine has a degree in Medical Science, a PhD in Molecular Biology and 15 years of experience in communicating science to a wide range of audiences. Elaine is an energetic and enthusiastic presenter. She creates high quality teaching materials and is willing to travel! Elaine holds regular courses in London and Manchester that anyone can attend – see the Course Diary for details. Elaine also travels the country presenting in-house study days for many hospitals, trials units, charities and pharma companies. Elaine recently partnered with Cancer Research UK to create a 5-week online course: ‘Demystifying targeted cancer treatments’, which will be repeated several times a year.